Every couple of years my family picks a theme and we all dress the same. Star Wars Halloween 2010 is the these of this year’s Halloween costumes. This year we picked Star Wars and I am not quite sure because my kids have never seen the movies nor read the books but we went with it anyway. Best part is the costume for Princess Leia was only $15 at Walmart. I bought a angel costume and wore a turtleneck underneath. My husband was able to borrow the costume and my daughter’s costume was mainly clothes from Lands End that she could wear again…. Also if you need a recipe to use up some of the left over candy or the abundance your children have brought home, try these candy brownies. 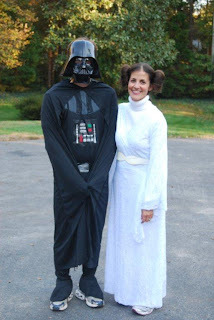 I am making them again this weekend for my son’s end of season soccer game..
Star Wars Halloween 2010 was a fun one for the Long Family, what did your kids or family dress as this year? love that you all dress with a theme!! and was going to search for a recipe to use up some of this candy…thanks!